This very popular site offers beautiful views of Tumalo Falls just a few minutes from the trailhead. There are areas for picnicking and access to hiking and mountain biking trails. The North Fork Trail is UPHILL ONLY for mountain bikes. Tumalo Falls is a 97-foot (30 m) waterfall on Tumalo Creek, in the Cascade Range west of Bend in the U.S. state of Oregon. Additional waterfalls are upstream along Tumalo Creek and a tributary, Bridge Creek and its Bridge Creek Falls. All of these falls are within the Deschutes National Forest. The United States Forest Service manages the Tumalo Falls Day Use Area about 14 miles (23 km) from Bend by forest roads. In addition to waterfall views, the day-use area has picnic sites and a toilet and offers access to trails for hiking and mountain biking. Using the site requires a Northwest Forest Pass or payment of a fee. Tumalo Falls Trail leads from the picnic area to a viewing platform above Tumalo Falls, about 0.25 miles (0.40 km) upstream. The trail continues beyond the falls. 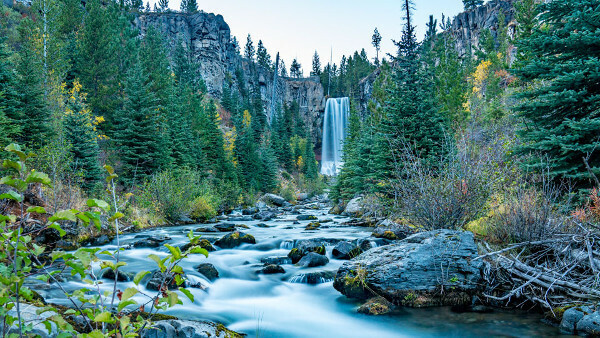 About 1.25 miles (2.01 km) further upstream, it reaches a second waterfall, Middle Tumalo Falls, a two-tiered cascade totaling 65 feet (20 m) in height.